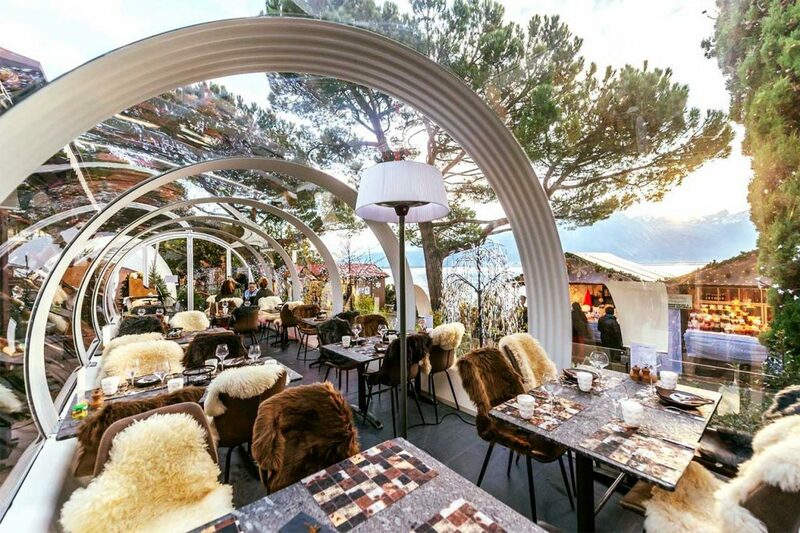 Functional and elegant, Tubbo is the trend of winter for many outdoor spaces in Switzerland. You can enjoy a Tubbo experience while enjoying a culinary experience high above the city of Zürich at the Sonnenberg Restaurant, having a hipster cocktail at Sandoase in Basel, appreciating a great fondue by the Leman Lake at the Eurotel Montreux, drinking champagne at the emblematic Beau-Rivage Palace or dining on Schweizerhof’s rooftop surrounded by the views of the city of Bern. When the cold weather takes hold and the snow covers the ground, Switzerland turns into an even more fascinating place. With its captivating natural sceneries spread across the territory, this country is a real winter wonderland during this chilly season but sometimes stepping outside could turn into a very hard decision usually more trouble than its worth. For this reason, many hospitality businesses are choosing to transform their outdoor spaces with Tubbo not only improving their customer’s outdoor experience but also offering a unique atmosphere with a charming touch and adding revenue from tables that otherwise wouldn’t exist. It’s no longer a question of season when it comes to stunning outdoor spots in this country.